Boxing coach Julius Odhiambo has expressed his disappointment in the manner boxers are treated in the country with little or no support from the concerned Federation and the Government. 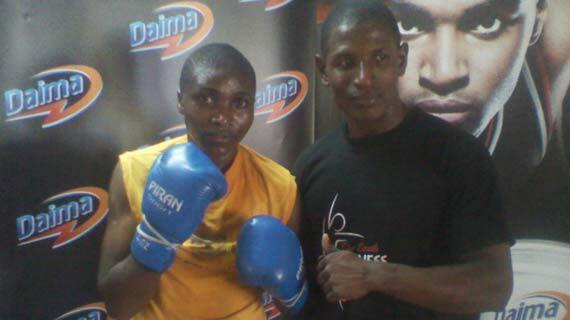 Odhiambo who has been coaching East and Central Africa Bantam weight boxing champion Fatuma Zarika for over 15 years now says coaches are forced to dig deeper into their pockets to assist the boxers develop their careers. “Boxers are left on their own whereas we expect them to perform well in international matches. It can never happen as long as we never recognize them.” He notes. “The whole obligation is left to the coaches who identify and nurture boxers until they come to public limelight. From there, unscrupulous agents and promoters avail themselves and take advantage of the boxers promising them heaven. We need strong bodies to protect our boxers.” He adds. Odhiambo who has a number of boxers under his care says he is sometimes forced to spend money which he doesn’t have in order to avoid disappointing boxers who look up to him. “Apart from Zarika, I have a number of other young boxers, financial constraints are the main challenges we face and hopefully something better will come through.” He adds. Odhiambo is currently preparing Zarika for her weekend bout against Belgian Delfine Persoon at the At Sporthal Schiervelde, Roeselare in Belgium on Saturday. “ I have had the opportunity to watch her opponent on a number of occasions in Netherlands. She is 34 years and good and we cannot afford to underestimate her, I have talked to Zarika to focus fully on her fight.” He adds. “It will be a tough fight no doubt, we are leaving on Thursday morning and we shall have a light gym work session on Friday evening before the fight on Saturday.” Odhiambo concluded.